Zopiclone (Zimovane - Datolan) is a sleep-inducing agent. It has been found to reduce the time to onset sleep and the frequency of nocturnal awakenings. Zopiclone (Zimovane - Datolan) is a sleep-inducing agent. It has been found to reduce the time to onset sleep and the frequency of nocturnal awakenings, therefore, increasing the quality of sleep and quality of awakening in the morning. Likewise zopiclone is a drug with sedative, anti-convulsant, anxiolytic, and muscle-relaxant properties. Doctors prescribe Zopiclone (Zimovane - Datolan) to treat sleeping disorders and all types of insomnia, especially when it&#039;s difficult to fall asleep either initially or after early awakening. In most cases, only short-term treatment with Zopiclone is necessary since generally treatment does not exceed 2 weeks. The treatment should be initiated with the minimum recommended dosage. Do not exceed on the maximum recommended dosage. 1. What is Zopiclone (Zimovane – Datolan)? Zopiclone (Zimovane - Datolan) is a sleep-inducing agent. It has been found to reduce the time to onset sleep and the frequency of nocturnal awakenings, therefore, increasing the quality of sleep and quality of awakening in the morning. Likewise zopiclone is a drug with sedative, anti-convulsant, anxiolytic, and muscle-relaxant properties. Doctors prescribe Zopiclone (Zimovane - Datolan) to treat sleeping disorders and all types of insomnia, especially when it's difficult to fall asleep either initially or after early awakening. In most cases, only short-term treatment with Zopiclone is necessary since generally treatment does not exceed 2 weeks. The treatment should be initiated with the minimum recommended dosage. Do not exceed on the maximum recommended dosage. Carefully read the instructions provided in section 3 ("How to take Zopiclone (Zimovane – Datolan)"). -You have any liver or kidney problems. - You suffer myasthenia gravis. - You have other diseases. - You are allergic to or sensitive to any of the ingredients of these tablets or to benzodiazepines in general. - You suffer respiratory difficulties, either sleep related or not, muscular problems or severe hepatic insufficiency. -You suffer drug or alcohol dependence. You must not take Zimovane unless formally indicated by your doctor. If you have any doubts consult your doctor. And remember that Zopiclone (Zimovane - Datolan) must not be administered to children. The use of zopiclone can lead to the development of dependence. This mainly occurs after taking the medication uninterruptedly during a long period of time. 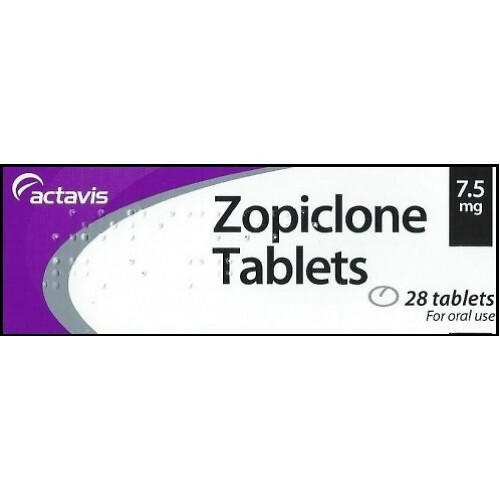 - Only take zopiclone when prescribed to you by a doctor (never because it has been effective with other patients) and never if recommended to you by other people. - Do not increase the doses prescribed by your doctor and do not prolong treatment more than the recommended period. - Consult your doctor regularly in order for him/her to decide whether you should continue treatment. After taking this medication make sure that you can rest without being woken for 7 hours. Zopiclone (Zimovane - Datolan) can affect the elderly more than the younger patients. If you are an elderly patient your doctor may prescribe a lower dose and check your response to the treatment. Please follow carefully the instructions of your doctor. If you have impaired liver or kidney function or suffered myasthenia gravis, your doctor will decide whether it is convenient for you to take a lower dose of Zopiclone (Zimovane - Datolan) or if you should not take it at all. You must consult your doctor or pharmacist before taking any medication. Before starting the treatment, inform your doctor if you are or suspecting that you are pregnant or intending to become pregnant. Your doctor will then decide whether it is convenient for you to take Zopiclone (Zimovane - Datolan). You must consult your doctor or pharmacist before taking any medication. Zopiclone (Zimovane - Datolan) will be excreted in breast milk if you take it.. Therefore, you should consult your doctor about the convenience of taking Zopiclone (Zimovane - Datolan) while you are breastfeeding. Your ability to drive or operate machinery may be adversely affected depending on your individual response. Therefore, bmake sure that your performance is not impaired before carrying out these activities . This tablet contains the excipient wheat starch. Patients with celiac disease must consult their doctor before taking this medication. Inform your doctor if you are taking any other medicines (even over-the-counter medication) before commencing treatment. This is extremely important because the simultaneous administration of some medicines can increase or decrease its effect. Therefore, you must not take other medications concomitantly with Zimovane unless your doctor is informed and has approve. For example, tranquillizers, sleep inducers and similar medications act on the brain and nerves and may enhance the effect of Zopiclone (Zimovane - Datolan). The simultaneous treatment of erythromycin (an antibiotic used to treat infections) and Zopiclone (Zimovane - Datolan) may enhance the effect of Zopiclone (Zimovane - Datolan). During treatment avoid alcoholic beverages. Concomitant intake with alcohol is not recommended since the sedative effect of Zopiclone (Zimovane - Datolan) may be enhanced and this may affect the ability to drive or operate machines. Ask your doctor if you require more information about this. 3. How to Take Zopliclone (Zimovane – Datolan)? Always take Zopiclone (Zimovane - Datolan) as recommended by your doctor. Your doctor will prescribe the appropriate dosage for you depending on the condition of your illness, your age and weight. Doctors will prescribe lower doses for elderly patients and to those with liver and kidney problems or those with myasthenia gravis. Just before going to sleep take Zopiclone (Zimovane - Datolan) by swallowing the tablet, without chewing it and with some water or non-alcoholic beverage. In normal conditions, it should not take more than 20 minutes to fall asleep after taking Zopiclone (Zimovane – Datolan). It is good if you make sure that you are able to sleep without being woken during at least 7 hours. If not, it is possible that you won't remember what occurred while you were awake (this only occurs on rare occasions). In order to avoid symptoms of abstinence, do not stop taking Zopiclone (Zimovane - Datolan) abruptly, especially if you have been taking it during a long period of time. Remember to take your medication. Each individual dose must not exceed the limit indicated; neither should the total daily dose, unless your doctor has prescribed a higher dose for you. - In the elderly and in patients with liver or kidney problems or chronic respiratory insufficiency: a dose of S tablet (3.75 mg. of zopiclone) is recommended initially. This may be increased to 1 tablet if necessary. You should never alter the prescribed dosage yourself. Consult your doctor if you think that the medication is too strong or too weak for you. If you have taken more Zopiclone (Zimovane - Datolan) than you should, call your doctor, pharmacist or nearest hospital immediately. In the case of an overdose or accidental ingestion, consult your local poison centre. If you forget to take Zopiclone (Zimovane – Datolan) never take a double dose to make up for the missed dose, just take your next dose at the usual time. The effects of ceasing Zopiclone (Zimovane - Datolan) treatment are you may experience restlessness, anxiety, insomnia, lack of concentration, headache and suffocation. The abrupt discontinuation of this medication is generally not recommended. It is therefore advised to decrease the dosage gradually in accordance with your doctor's instructions. As well as benefits, Zopiclone (Zimovane - Datolan) may have unwanted effects in some patients, even when the medication is being taken appropriately. The most common side effect observed with zopiclone is its bitter taste. Zopiclone (Zimovane - Datolan) is well tolerated by most patients, but some patients may feel tired and sleepy during the day particularly at the beginning of treatment. Anterograde amnesia may also occur. This happens when the patient does not remember what occurred while they were awake after having taken the medication. Therefore, the patient should ensure that they are able to sleep during at least 7 hours without being disturbed. On rare occasions, Zopiclone (Zimovane - Datolan) may cause sudden anxiety, hallucinations, excitation and sleep disorders. If this occurs consult your doctor immediately. If you notice any other reactions not mentioned in this patient information leaflet, inform your doctor or pharmacist immediately. There are no special precautions for storage are required. Expiry: You must not take these tablets after the expiry date on the carton.